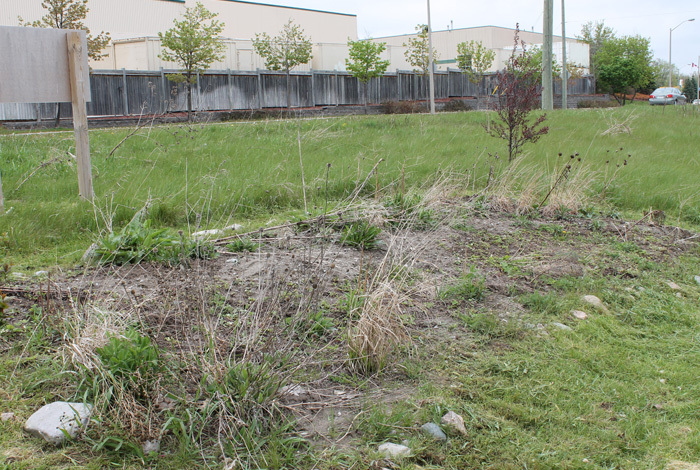 Where we started -- a rough, vacant area in the City of Barrie. 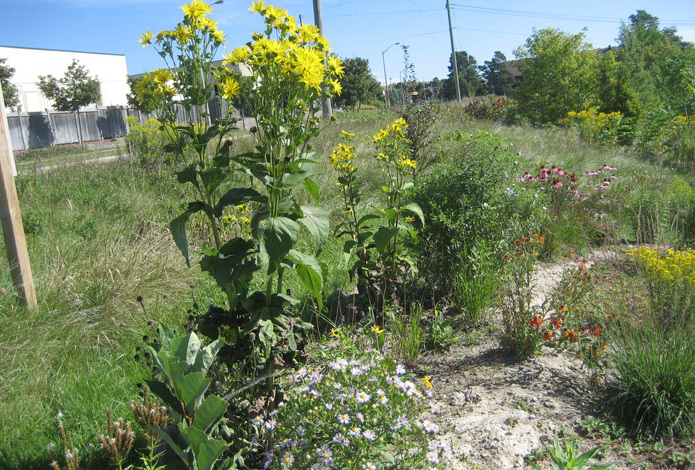 We received City permission to plant a 10m by 3m plot. 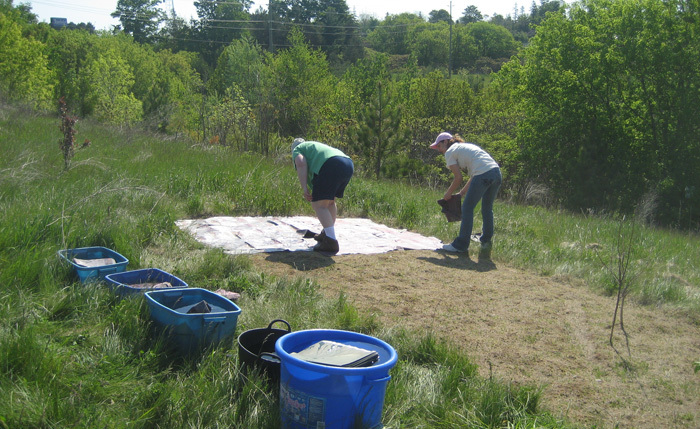 After weed-whacking the site very close to the ground, we applied a thick layer of wet newspapers. This was the yuckies part of the whole job. 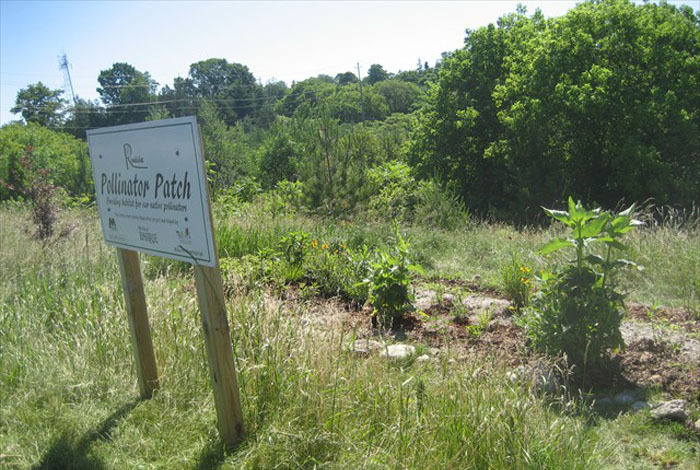 We used construction soil for the patch. 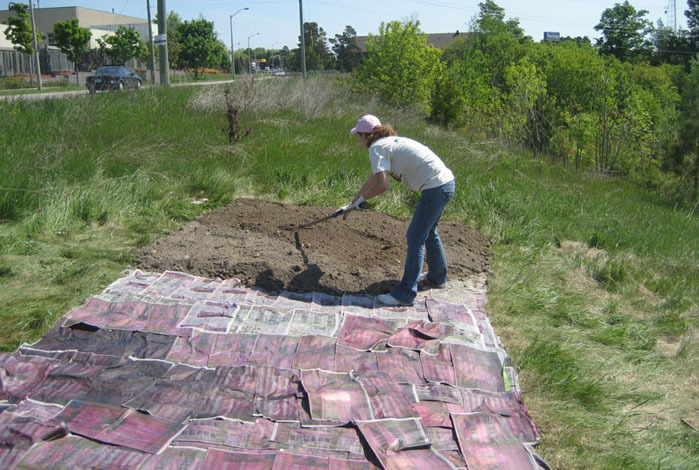 In this photo we are laying the soil on top of the newspaper layer. This is the great part of doing the patch this way. The day after we put down the soil we were ready to plant. 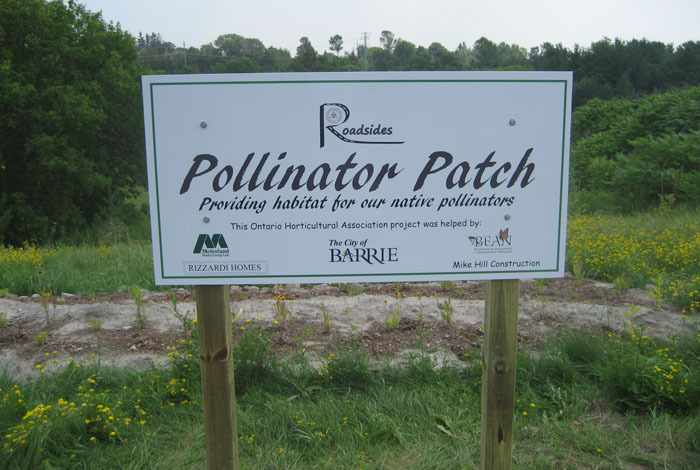 In all we used 67 native plants. 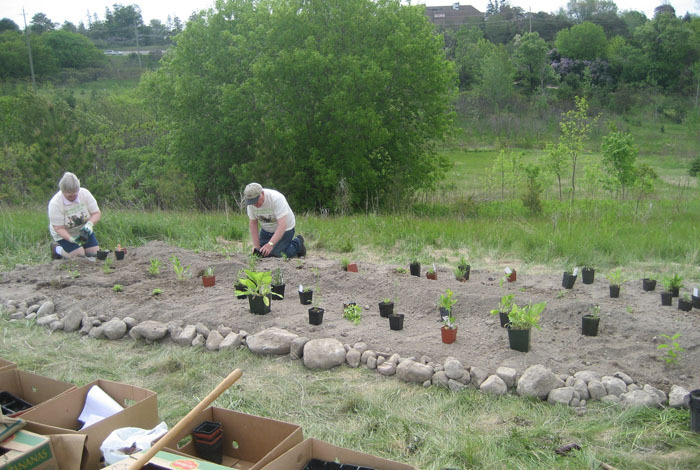 All the plants were sourced in Ontario less than 50 miles from the site. Notice the rocks we got out of our soil. It wasn't pretty but it will work. 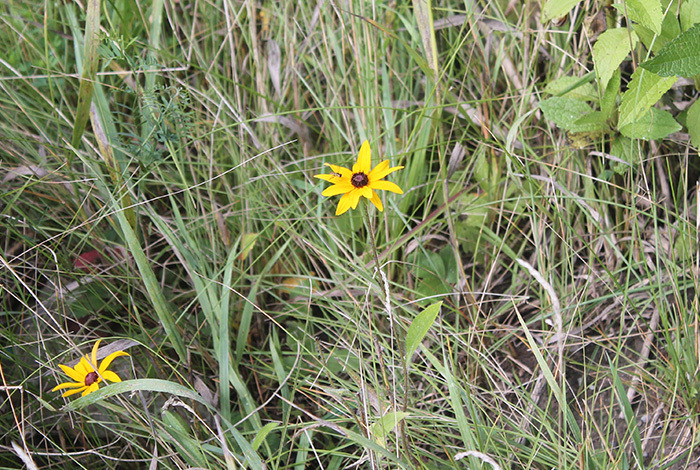 Native plants like their soil lean and mean. Now begins the watering of the new plants. For the first little while, we watered every 2 days. Sign was put up with the help of the City. Funnily enough it has never been vandalized. The beginning of the 2nd year. Everything wintered well. Plants are up and ready for summer. The grass around the patch needs to be week-whacked to make access easier and to hold the alien grass at bey for a while. 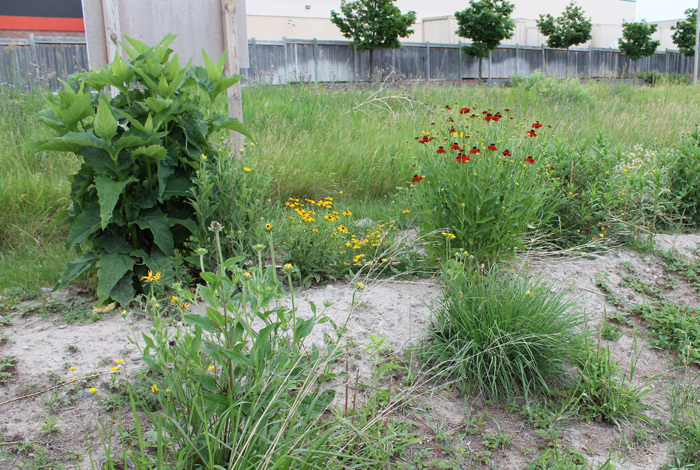 This year we will water and weed less than the first year. .
A spring shot before too much growth. 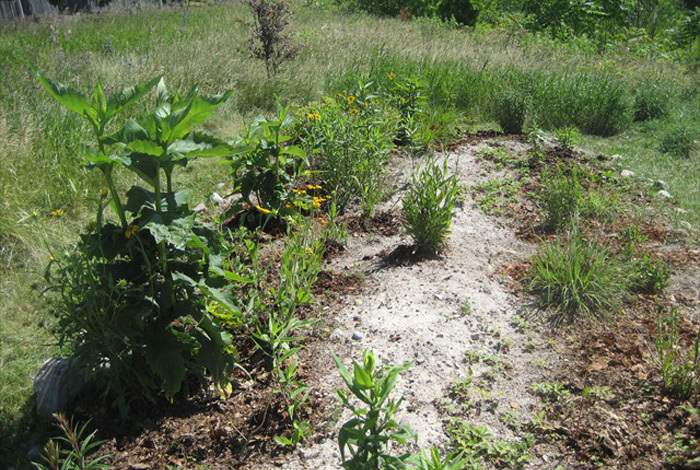 Notice the "backbone" of open soil for ground-nesting bees. Isn't the Cup Plant gloriious? 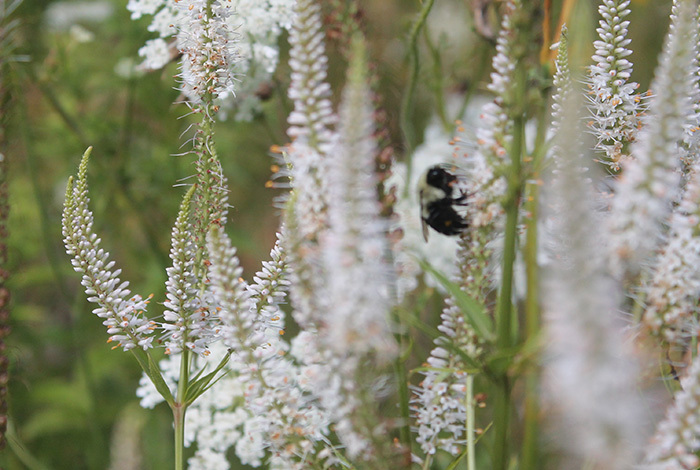 The bees think it's wonderful, too. Always a crowd of bees around it. 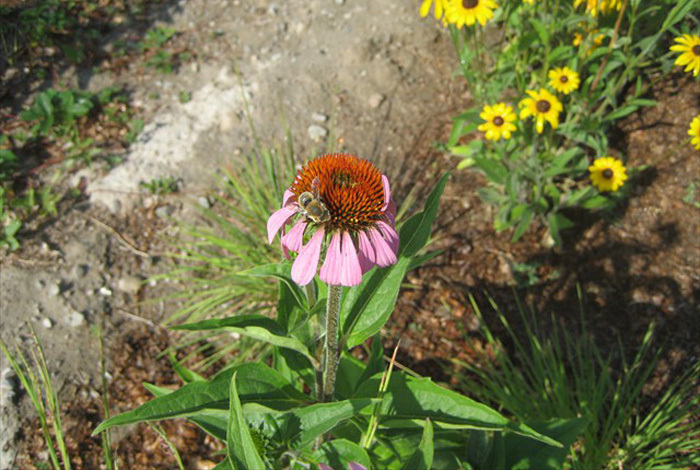 What it's all about -- a bee on one of our plants -- Echinacea Pallida. 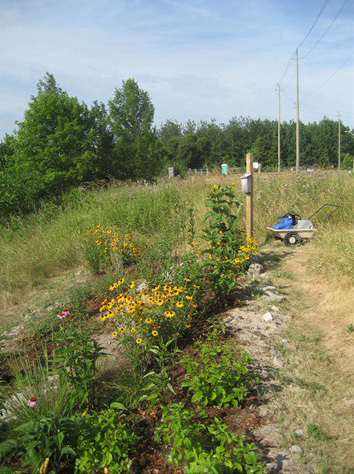 At the top of the garden you can just see our watering system -- 3 water bladders hold 5 gallons each. 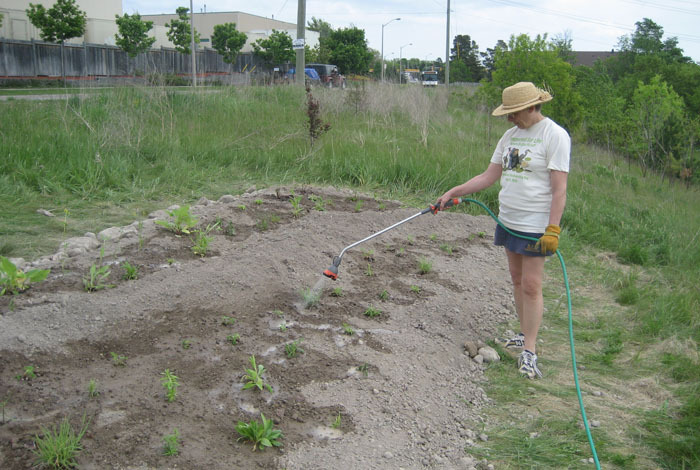 Accompanied with two watering cans. That's our watering system. 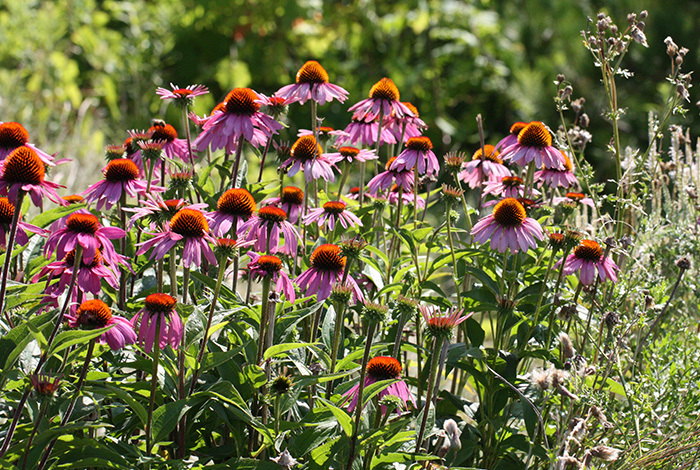 The garden is just coming to life. It doesn't look like much now but just wait until the weather warms up a bit. You can see the "backbone" clearly in this shot. 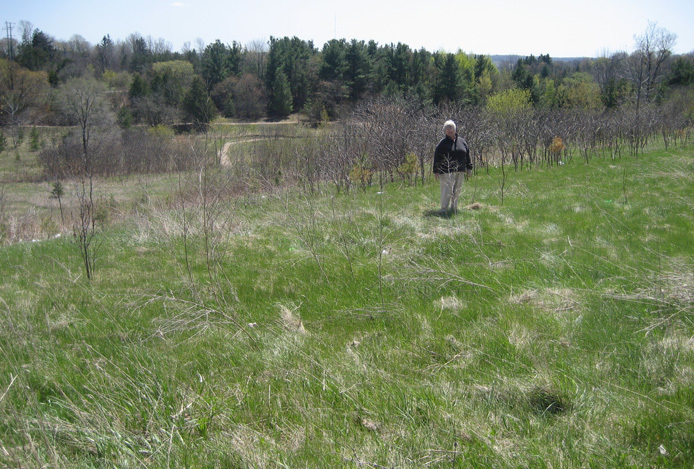 This area is left bare so that ground-nesting native bees may use it to make their nests.. 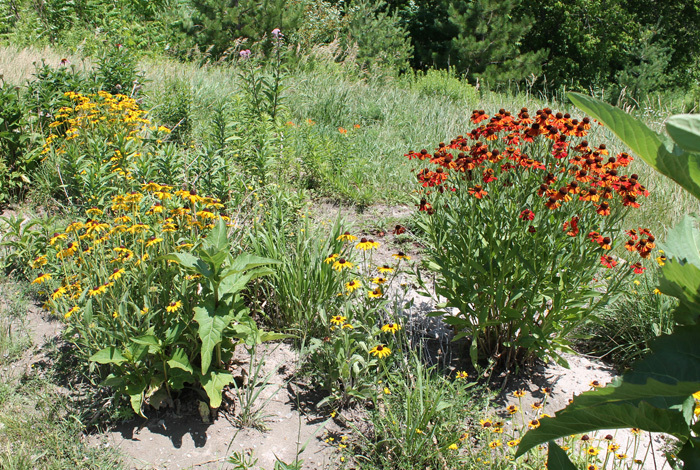 The orange plant is Helenium. 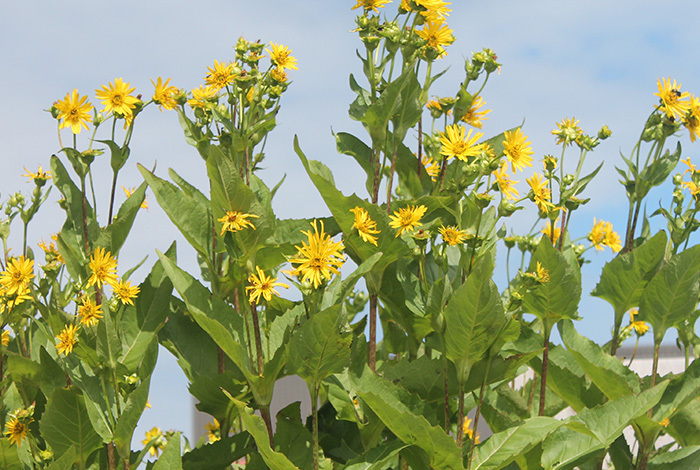 It makes a grand show and the bees love it..
See how tall the Cup Plant is in June. It is almost ready to bloom. A very bare patch in November. We do not "clean" the area at all. 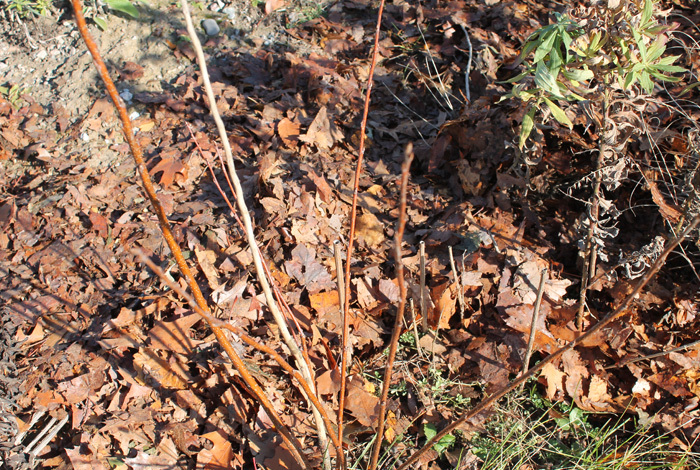 It is left as it is to preserve any invertebrates who may be planning to overwinter in stems and on branches of plants..
To improve the soil we added mulch -- but only to the planting area. 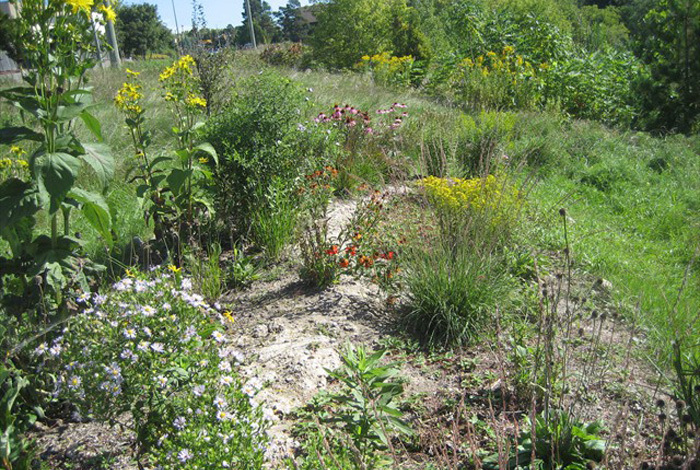 The centre hump was left bare to provide a nest-building area for ground nessting bees. 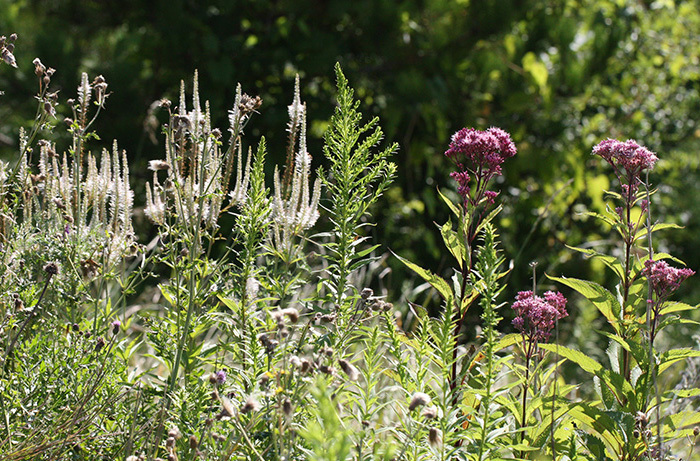 Early August and Culvers Root and Joe-Pye-Weed are blooming well without any care. 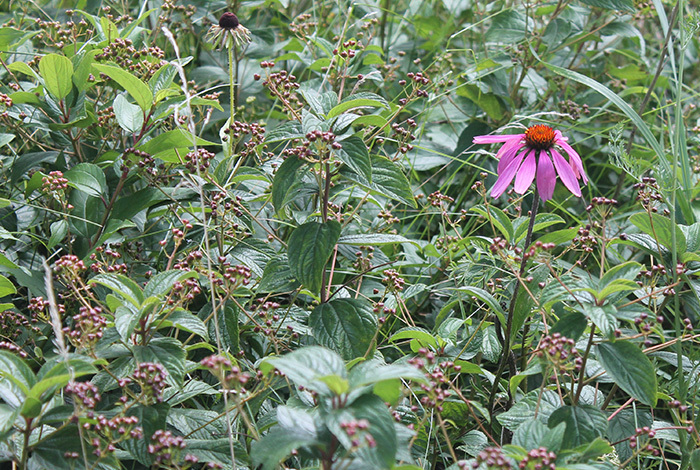 The coneflowers are out-competing plants from the surrounding area this year. 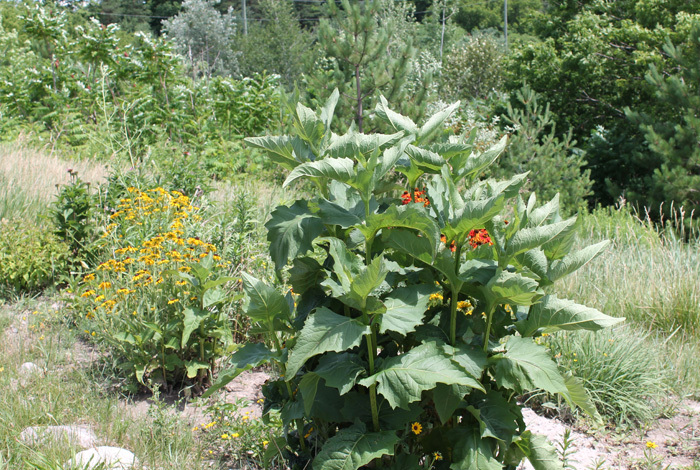 The Rudbeckia hirta has begun to self-seed outside the original patch. 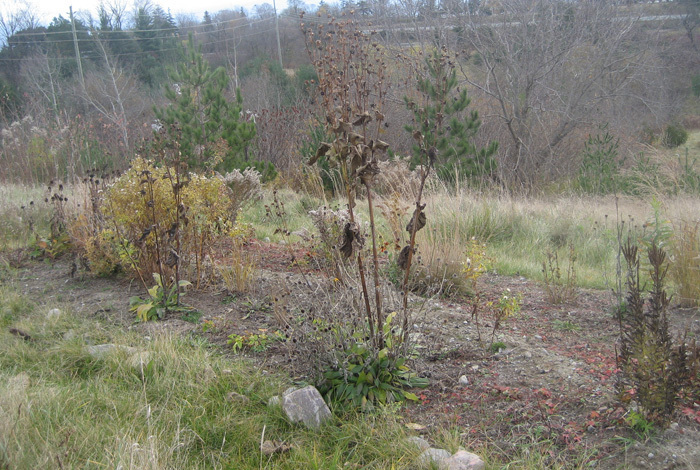 One patch of Veronicastrum remains. It looks healthy. 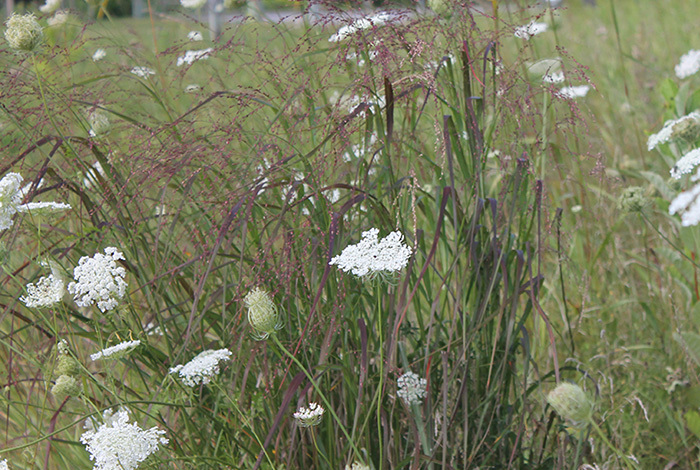 The one remaining clump of Little Blue Stem thrives amongst invading Queen Anne's Lace. The patch works. 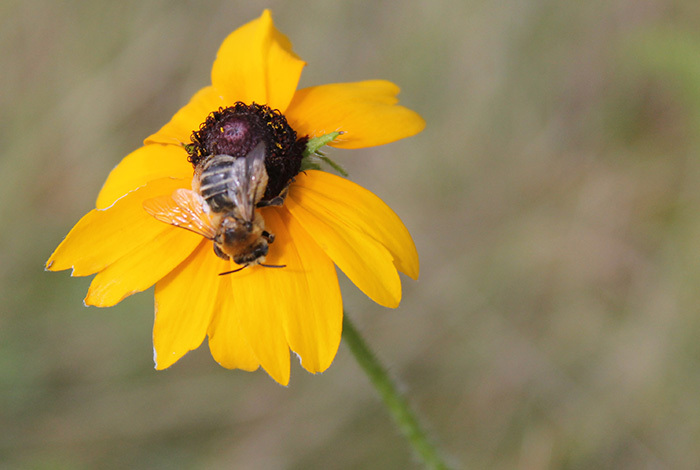 Here's a bee on the Rudbeckia despite it being a cool, windy day. Doing well and very showy from the street.